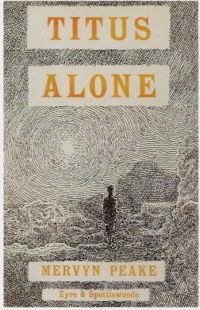 Published in 1959, Titus Alone is the last of the Gormenghast trilogy. It takes up the story of Titus Groan, the seventy seventh Earl of Gormenghast, who has forsaken his title and left the ancient castle walls of his home to embark on a very weird walkabout. And weird it certainly is. As well as being very different in style and tone, Titus Alone at times inhabits a completely different universe to its predecessors. Where Mervyn Peake’s previous two instalments are set in an apparently pre-technological era, where characters are reliant on natural light and creep around with candles in the night’s gloom, Titus stumbles into an almost futuristic age, complete with space age cars and flying machines. Meanwhile Mr Acreblade was making room for a long-faced character dressed in a lion’s pelt. Over his head and shoulders was a black mane. ‘Isn’t it a bit hot in there?’ said young Kestrel. ‘I am in agony,’ said the man in the tawny skin. ‘Then why?’ said Mrs Grass. ‘It is all I have on,’ said the lion’s pelt. What on Earth is going on? You may well ask. It’s just a very, very odd and outstandingly original work. Just as Titus has forsaken Gormenghast castle, Peake has lost his debt to Dickens for his inspiration. Instead, take a pinch of Aldous Huxley and H.G. Wells, throw them together with a generous helping of Samuel Beckett and Franz Kafka and you’re some of the way to grasping Titus Alone. This is the oddest of sequels. It has a very post-apocalyptic feel to it (and you can maybe take the near-apocalyptic storm in Gormenghast as a starting point). Recent fiction also owes a debt to Titus Alone, including Martin Amis and Margaret Atwood’s Oryx and Crake. But as a British novel from the late 1950s, the closest of Peake’s contemporaries I can think of is William Golding. Steerpike was aware, directly he had entered the terrible room, that he was behaving strangely. He could have stopped himself at any moment. But to have stopped himself would have been to have stopped a valve – to have bottled up something which would have clamoured for release. For Steerpike was anything but inhibited. His control that had so seldom broken had never frustrated him. In one way that this new expression had need of an outlet he gave himself up to whatever his blood dictated. He was watching himself, but only so that he would miss nothing. He was the vehicle through which the gods were working. The dim primordial gods of power and blood. Time for some more Mervyn Peake. After enjoying Titus Groan so much, I’d been very eager to read Gormenghast, the second book in Peake’s trilogy. It’s an incredible book, which manages to surpass its predecessor in imagination, dark humour, excitement and horror. I’m confidently giving it ten out of ten. If you haven’t read it – I urge you to. Rather than a sequel, Gormenghast is a continuation of Titus Groan. The first two books in the series fit together snugly like parts of a gargantuan novel that just gets better and better. The setting is still the ancient, vast and labyrinthine castle and we are reintroduced to Titus, seventy seventh Earl of Gormenghast. He’s now seven years old, and the book follows him through his childhood and into early adulthood. The narrative also picks up on the Machiavellian Steerpike, still working his way up through the ranks of the castle, and still resorting to manipulation and murder. Other characters surviving from the first novel include the eccentric Dr Prunesquallor and his very strange sister Irma, Titus’ lonely sister Fuchsia and Mister Flay, former servant to the Earl of Gormenghast. Gormenghast manages to be both hilarious and deeply disturbing. I laughed out loud at the scenes involving Irma’s party, when she invites the entire cast of the castle’s eccentric and mostly elderly scoolmasters to her elaborate soirée in her search for an eligible husband. The chapters are as witty as anything Dickens has produced, perhaps even more so. Beneath the humour, Peake can also convey the despair at wasted and unfulfilled lives. It’s undeniably funny, but when Irma does find her match it’s still ultimately a grim life for her. All of the inhabitants of Gormenghast are trapped for life, and amongst them only Titus – ironically the most important of them all – longs to escape from the oppressing stone walls forever. Steerpike’s descent into total evil provides the disturbing aspect of the book. In order to rid himself of his former accomplices, the mad sisters Cora and Clarice, he simply locks them away in a deserted part of the castle and forgets about them as they slowly starve to death. He’s a cold and calculating as you’d expect the best literary villain to be, and the scenes where Flay unwittingly eavesdrops on the sisters’ horrible fate are genuinely chilling, as are the last minutes of Barquentine’s life. The book is also genuinely moving, and the desperate and sudden suicide of one of the novel’s characters is an incredibly effective piece of writing. Peake proves himself as a real master of suspense in this novel. He’s mapped out the entire castle in his mind, and brings to life every shadow, deserted corridor and forgotten room. Reading the book, I sat up half of the night racing through the chapters where the suspicious Flay, Prunesquallor and Titus follow Steerpike through the dark, endless and maze-like corridors. Excitement, curiosity and fear are evoked in the reader in equal proportions. For the reader, The most satisfying aspect of Gormenghast is finally being able to decide on the heroes, villain and victims of the piece. Prunesquallor, only really a comic character in the first part, becomes believably and admirably heroic in the second, and Steerpike, although undeniably wicked, is always strangely compelling. We share his desires, his motives and his successes. And let’s not forget Fuchsia, who – although subtly drawn – is still one of literature’s truly tragic figures. I’ve still the last part, Titus Alone, to finish. I urge you to catch up with me and start reading now. It’s a work of genius. 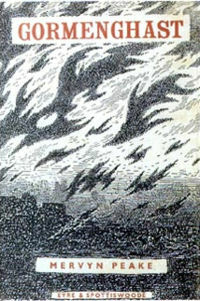 Although I’m keen to read the rest of the Gormenghast trilogy, I’m conscious of this becoming too much of a Titus Blog. So I think it’s time to read a couple of other books before I return to Mervyn Peake. I highly recommend Titus Groan, however, even though the novel is a touch overlong at 500 pages. What works best in the book is Peake’s skill at conveying a sense of space, not only in the vastness of the castle but in each character’s own sense of perspective. In a memorable chapter, Steerpike stands on the castle roof and surveys all around him in great detail. He can see for miles around and takes time to digest as much as he can of his surroundings. And this is what makes Steerpike such a success; he can see exactly what’s going on, whereas most of the other characters in Titus Groan are blinkered, eccentric or, most chillingly, mad. Other residents of Gormenghast can only struggle to see what’s happening or predict what is going to happen – Peake always conveys the dependence on natural light and the inevitable gloom and shadows that envelop the castle each day. In another memorable scene, the servant Flay spies, by chance, his enemy the drunken chef Swelter as he rehearses an act of murder. As he secretly peers through the gloomy half light he suddenly realises that the murder is his own. But enough – I’m saving a full review until I’ve eventually read the whole series. 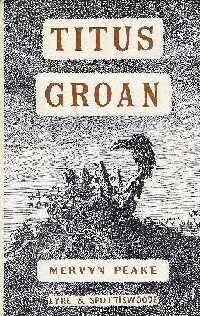 Titus Groan was written in 1946, and Peake followed it in 1950 with the equally lengthy Gormenghast. The last book was published in 1959, the comparitively slim Titus Alone. I’ll hopefully be through them all quite quickly, to provide more half glimpsed visions of murder and madness. Behind him she saw something which by contrast with the alien, incalculable figure before her, was close and real. It was something which she understood, something which she could never do without, for it seemed as though it were her own self, her own body, at which she gazed and which lay so intimately upon the skyline. Gormenghast. The long, notched outline of her home. It was now his background. It was a screen of walls and towers pocked with windows. He stood against it, an intruder, imposing himself so vividly, so solidly, against her world, his head overtopping the loftiest of its towers. Greed, ambition, the desire for self-advancement. Ultimately, evil. In Titus Groan, Steerpike appears to Lady Fuchsia to be larger than the vast castle of Gormenghast, overpowering it and engulfing it, his ambition manifest. Titus Groan isn’t the fantastic tale I’d anticipated. Greed, ambition, self-advancement. We see it every day. She was propped against several pillows and a black shawl was draped around her shoulders. Her hair, a very dark red colour of great lustre, appeared to have been left suddenly while being woven into a knotted structure on the top of her head. Thick coils fell about her shoulders, or clustered upon the pillows like burning snakes.